I’m having a washing machine kind of time. You know, when lots of impressions and ideas and thoughts and plans just churn around and are jumbled together like clothes in a washing machine. It feels quite unsettling. It’s all to do with trying to get some traction for the Westacre Spiritual Centre as a business. I have been playing with ideas about formulating my core message (see image) and engaging my audience with it. While I was playing with that core message, I felt like I knew what I was doing. That I was really on to something. But when I tried it out on my audience, just a couple of whispers came back*. And then silence. And I felt frustrated. Now what? It seems obvious that I have been talking to the wrong people. My friends don’t need my help with their spiritual path. They’re pretty well settled and know what they’re doing. I need a way to communicate with people who are still trying to find their way. I had a moan at a friend. He was very supportive and came up with some ideas I would never have considered on my own. One of those ideas was selling online coaching. The idea would be to help a younger generation of Pagans find their path and their practice, for an affordable monthly fee. I like that idea. I’ll be sure to let you know when that is launched. He also encouraged me to start a Tumblr blog. I had heard of Tumblr, but I had no idea what it did. So I have set up an account and have been playing around. It would appear I have a Tumblr blog now. Jumbled together in my brain’s washing machine, those two things soon got linked. If I start answering young pagans’ questions on Tumblr, I can start building a presence and a reputation. And when that happens, I can launch my coaching. That sounds like a plan, doesn’t it? But unfortunately, those are not the only items in the washing machine. I’m still stuck on my core message. I liked it. It really contains my heart and soul. It is what I want to say to the world. I’ve put some work into developing it already. But I doubt it would appeal to the Tumblr audience. What do I have to say to them? And to a large extent that will depend on what I find they are asking. Will I have to change it all? 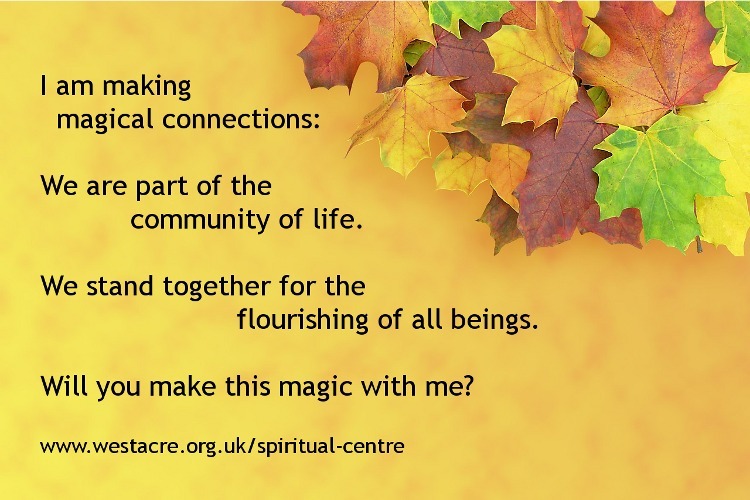 Was all that time I spent re-writing the front page of the Westacre Spiritual Centre web site wasted? Have I got the wrong end of the stick? Where am I going and, fundamentally, who am I? When it goes all the way to questions of identity, I know I have to slow down and come back down to basics. I need some sage advice. And I know where that is to be found. I’ve known for a long time, but it seems strange to ask. For the first time, I am involving the Spirits who guide me into the nitty gritty of business development. Well, a month or so ago I blogged about developing my trust. This is how you do it. Step by little step. Asking for guidance and implementing it, however small it may seem. And that way, change feels manageable. The washing machine is still going. I’m not looking forward to the spin cycle. But eventually the wash will end and something beautifully fresh and clean will come out. I’m off to play on Tumblr now. Come by and visit if you fancy.